The referees were equipped with a microphone in listening mode only, which allows them to receive the instructions of their trainer in real time, in this way they can better understand how to take correct decisions in a game situation. At this level, the young referees do not communicate with each other so that they can focus themselves on their individual tasks. Inter-referee communication are used only at the professional level. The Vokkero Squadra allowed us to train our referees for 2 weekly training sessions. These young referees became national school referees, partly thanks to the use of this equipment. » R.Pelletier, Manager of the Val de Loire training center of basketball young referees! Audio kit 2/3 users ready-to-use includes terminals, configurator, charger and several accessories for professional referee. 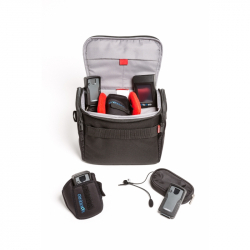 Audio kit ready-to-use, 4 to 8 users, includes terminals, configurator, charger and several accessories for professionals referees. 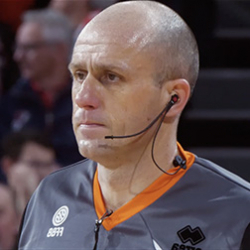 Wireless audio communication solutions for Basketball referees.